Paydens.com - Who are Paydens? Paydens Group is an independent family owned company established in 1969. We operate pharmacies across the South-East of England, with our Head Office based in Maidstone, Kent. Paydens welcomes the new age of pharmacy that is evolving. We approach the challenges of developing the pharmacy role within the local community with enthusiasm and firmly believe in serving community healthcare needs with commitment and a professional attitude. We offer a winning combination of the personal and adaptable services of an individual pharmacy but with the added security, resources and backing of the Paydens Group. 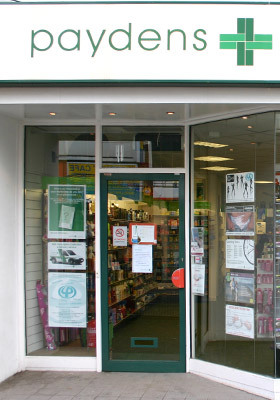 Our pharmacies vary in size from a small village pharmacy to large high street shops with additional departments such as photograph processing, a perfumery and alternative therapies. The pharmacies around Kent, Sussex and Surrey do take care of a number of Residential and Nursing Homes and give advice and help to them on a regular basis. We are also able to offer a service to those being cared for at home and a large number of patients have medication trays delivered directly. Paydens pharmacies stock many of the leading brands as well as a range of exciting new products you will not have come across before. Paydens is a member of The National Pharmaceutical Association (NPA). Paydens pharmacists are all members of the General Pharmaceutical Council.